Social media can be so awesome. Star Wars Day, May the 4th,( be with you) is an awesome pun that was starting in the UK in 1979 (you guys are so punny! ), but due to social media has become a globally observed holiday. One of these years I am going to go all out; I will plan a party, have a movie marathon in the backyard, and make lots of themed snacks and desserts. I swear I will share every detail with you. 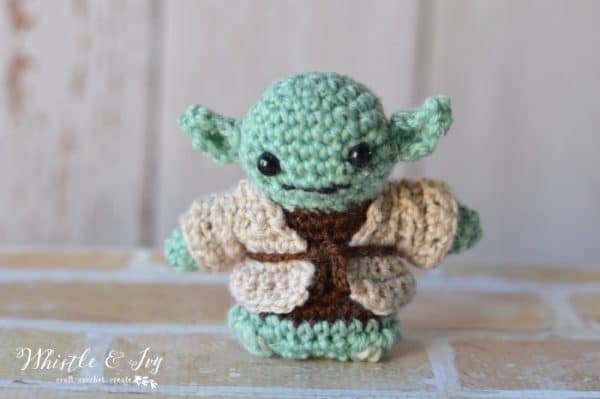 But for this year, I went small and made this adorable crochet Yoda amigurumi. So, let me explain myself. This is my first miniature amigurumi (I think the photo deserves an explanation). The pattern IS NOT hard. It’s very easy, actually. But I think using a small hook, thinner yarn, and creating small, delicate shapes takes a bit of practice. I might go through the characters making my least-favorites first, and work my way to my favorites (that Ewok stole my heart!). I swear the eyes looked even when I put them on. Not so much. I highly recommend this kit. 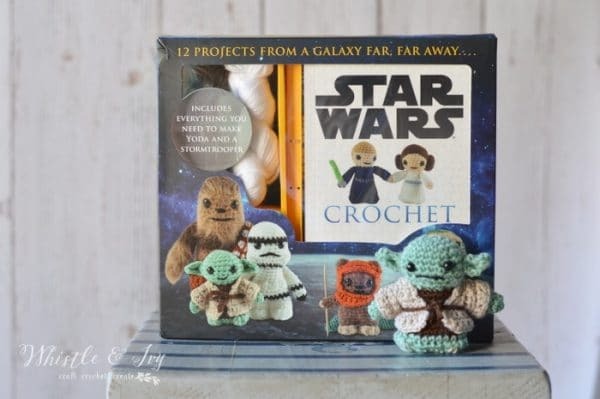 Although I was under the impression that it included yarn and supplies for ALL the characters, (despite the large lettering on the front that says otherwise) I feel I should tell you that it has materials for a storm trooper and Yoda, but all the character patterns are included in the pattern book. It comes with way more stuffing than you would need for the two, so just a few scraps of yarn is all you would need to make the other characters. affiliate link–> Get the Star Wars Classic Characters Kit here. I’m gonna give the stormtrooper and Darth Vader a try, and then I might go straight for the Ewok. That guy is just too adorable. Like this post? Be sure to subscribe so you don’t miss anything! 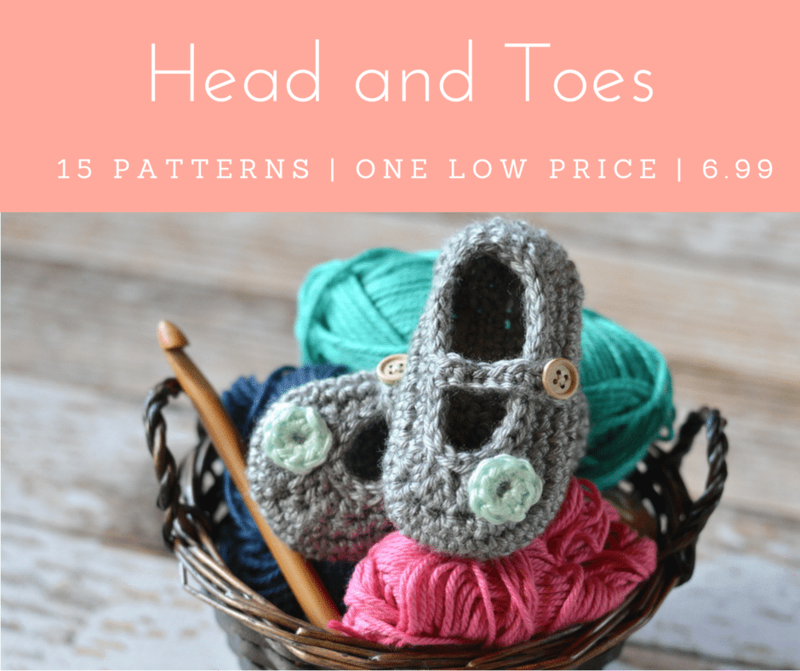 The feet are basically just little bobble stitches. Are you familiar with those? Very nice crochet craft. Thank you for sharing with us at Merry Monday. That’s adorable!! My hubby would love them. 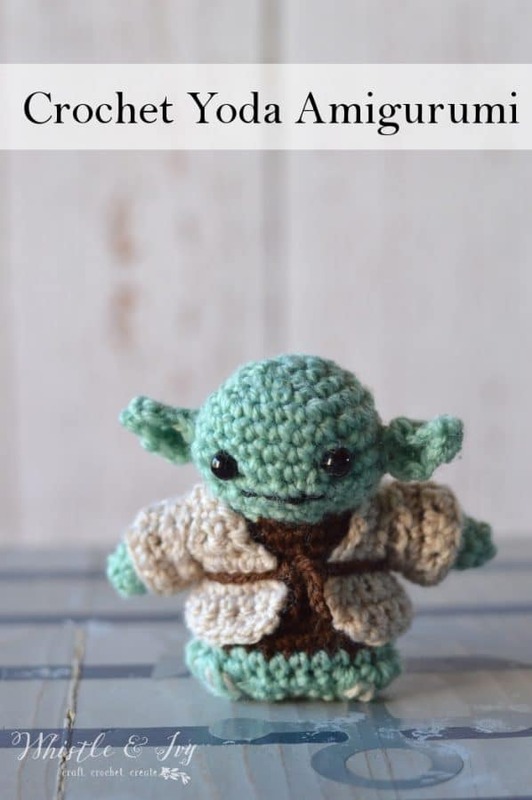 I have to learn how to crochet patterns so I can have this done by Yule next year. 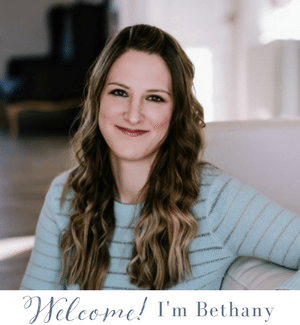 Have you linked up at #bloggerspotlight this week? Yay! I hope you enjoy making it! !